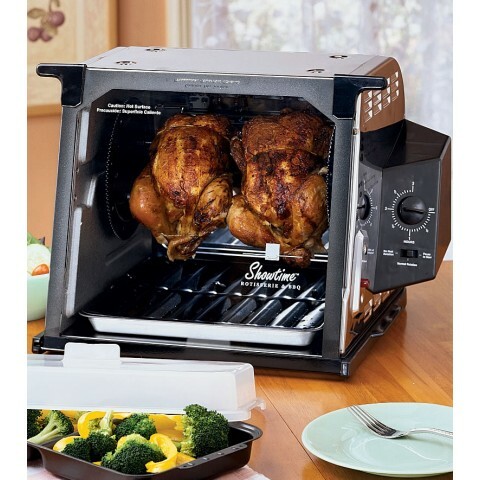 Only as big as a toaster oven, this rotisserie and barbeque will amaze you! Prepare vegetables, kabobs, even a 15-lb. turkey. All parts are nonstick and dishwasher safe, even the glass door. A nonstick rotisserie basket fits right on the spit rods to allow for even cooking of steaks, fish, vegetables and chicken pieces. Kabob rods are self-turning and also fit on the spit, making it easy to make any type of kabob you choose. The included flavor injector lets you inject delicious flavored marinades and seasonings directly into meat. Also includes food ties for chickens, an instructional video, barbeque gloves and a loading and carving base.